"Plenty of charming characters, red herrings, labyrinthine twists and turns and brushes with death before you can even begin to guess whodunit. 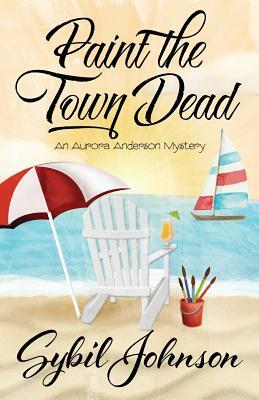 Paint the Town Dead is a cleverly crafted mystery full of secrets and intrigues that kept me guessing till the end." - Connie Archer, National Bestselling Author of the Soup Lover's Mystery Series "Lots of twists and turns make this novel fun to read. An enjoyable series with delightful characters." - Librarian, Penn State University "Johnson paints characters with a folksy charm that makes them feel like family...Color me a fan " - Diane Vallere, Author of the Material Witness, Style & Error, and Madison Night Mysteries "Rory is definitely a quirky character; she has the ability to draw the readers in so that they want to follow her through her adventures." - Suspense Magazine "The plot thickens and becomes more entangled as Rory pursues all and any possible angles to catch the killer]. Many intriguing complications arise during this search for the truth. An easy to read mystery with an amateur female sleuth who is a very likeable and believable character." - LibraryThing "Rory finds herself needing to uncover the truth of a friend's shocking death as everyone else seems satisfied with the easy answer. She's willing to risk friendships, and her own life, to chip away to reach the unvarnished truth. Paint the Town Dead is an engaging mystery set amidst a painting convention and showcases the complexity of relationships when a tragedy strikes." - Christina Freeburn, Author of Framed to Death The Ocean Painting Society invites you to join the painting wave... It's June in the quiet Los Angeles County city of Vista Beach, the place computer programmer and tole-painting enthusiast Aurora (Rory) Anderson calls home. Decorative painters are flocking to the newly built Akaw hotel to attend the Ocean Painting Society's inaugural convention. During the weeklong event, Rory plans on shopping the trade show floor, working in her mother's booth, taking classes and connecting with other decorative painting fans. She doesn't expect to witness her childhood friend collapse in class and die. When the police find no evidence of foul play, Rory embarks on her own investigation. Can she brush aside the lies to uncover the truth and bring the killer to justice? Related subjects include: cozy mysteries, women sleuths, murder mystery series, whodunit mysteries (whodunnit), amateur sleuth books, book club recommendations, craft and hobby mysteries. Books in the Aurora Anderson Mystery Series: FATAL BRUSHSTROKE (#1) PAINT THE TOWN DEAD (#2) Part of the Henery Press Mystery Series Collection, if you like one, you'll probably like them all... Author Bio: Sybil Johnson's love affair with reading began in kindergarten with "The Three Little Pigs." Visits to the library introduced her to Encyclopedia Brown, Mrs. Piggle-Wiggle and a host of other characters. Fast forward to college where she continued reading while studying Computer Science. After a rewarding career in the computer industry, Sybil decided to try her hand at writing mysteries. Her short fiction has appeared in Mysterical-E and Spinetingler Magazine, among others. Originally from the Pacific Northwest, she now lives in Southern California where she enjoys tole painting, studying ancient languages and spending time with friends and family.